I feel pretty bad that this wallpaper seem to be a slap. This was started like maybe after I posted the wallpaper before this one. I mean the background starts are plain, there wasn't must creativity, and flames didn't go as well as I hoped when I tried to fix it. x.x I was working on the skies for 3 hrs, but maybe it wasn't enough. thought after all this is an old wallpaper that was discontinued time after time like the many other 13 ones. o.o I think I worked on this maybe close to 2 days, but it's hard to recall. I definitely know the flames took 2 hrs or so. I just wanted to post this just to let everyone know that I'm still alive I mean. I know that all my friends or MT members have improved soooo much from the last time I recall 1 year and a half ago. But I guess then I have a long way to trying to improve my skills whenever I have the time. 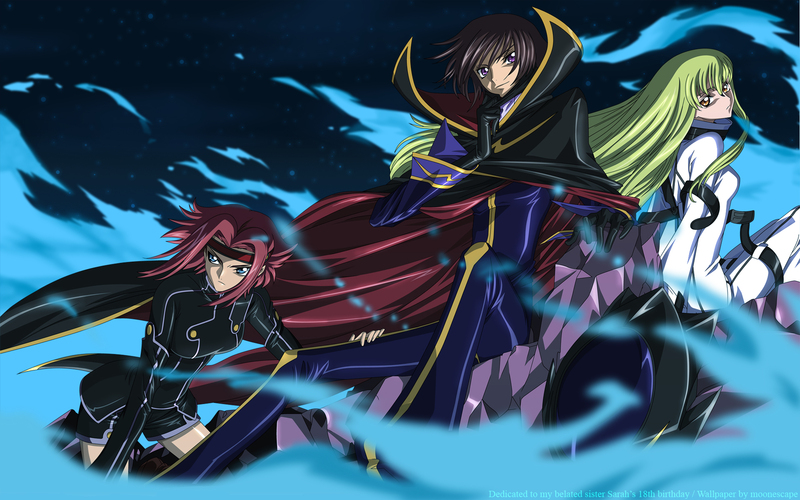 This wallpaper was dedicated to my older sister and at that time she was really into Code Geass for awhile so I decided to make a wallpaper from Code Geass and one of the reasons why I just did black outlines was she prefers it better than those kind of color outlines. I'm so sorry that I haven't been able to do much to be active of posting. I'll try to post the groups when I get the chance to go on the computer next week. The vector work is really neat and smoothe, I like that. I don't really like the flames, they're too painty and blurry compared to the characters. The sky looks nice. I amost think that if you'd done the flames as a regular vector and made the slightly transparent they'd look better, but I'm guessing the scan had the flames so there aren't any character lines underneath them. It's a good wall, I'm just not a fan of the flames. wow its been a really long time since your last wall. i just love the composition of this, it feels like a fresh blast from the past when wallers knew alot about simple but effective composition. their faces are a little strange to me but thats probably because of the scan. i do think the background needs some subtle oranges/reds though, since their faces are still warmer in tone. great a colors, i like this wallpaper! it was nice . i like this wallpaper. i really like this one. it's a really great group wall, you don't see many of those from code geass. thanks for sharing! it's such a beautiful scan! Very nice job, thanks for sharing! Well done! Keep it up and thanks for sharing!